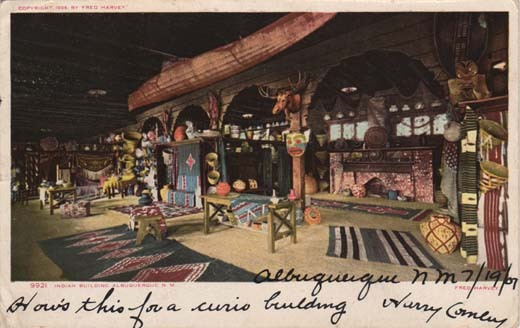 The Indian and Mexican Buildings at Albuquerque, New Mexico, houses the finest, rarest, and most interesting collection of Indian and Mexican handiwork in this country. 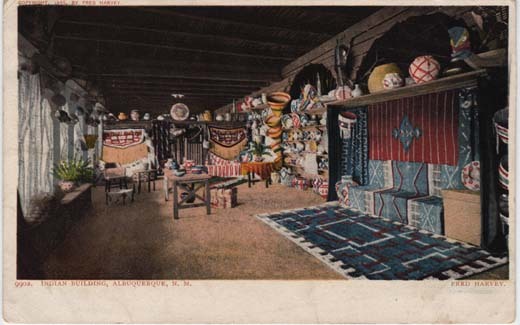 In this building you can see Indian women carding, spinning and dyeing wool and weaving blankets. The men making primitive silver ornaments. All this carried on in the very crude way handed down by generations long past. 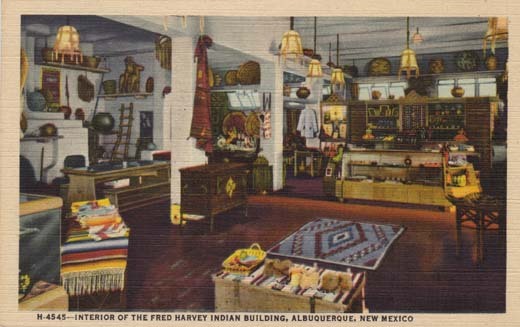 The Fred Harvey Indian Museum at Albuquerque contains some of the world’s rarest collections of Indian handicraft. In addition, there are fine Mexican collections and many objects telling the story of the Spanish influence upon the history of the Southwest. 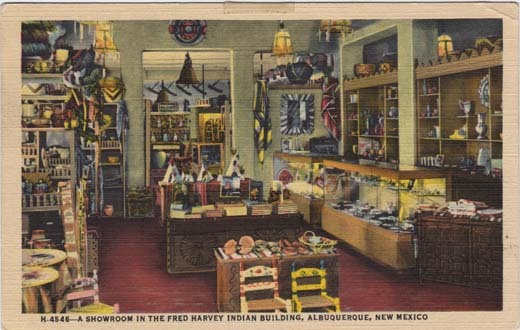 In Fred Harvey’s Indian Museum at Albuquerque are gathered some of the rarest collections of Indian handicraft. In addition, there are fine Mexican and Spanish collections. 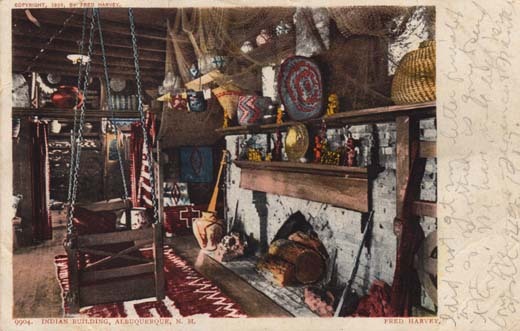 Many of the exhibits suggest practical uses of the various articles as home furnishings and decorations. 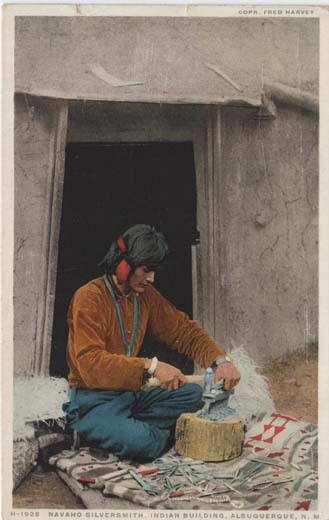 Navaho Silversmith, Indian Building, Albuquerque, N. M.
The Navaho silversmiths learned their art centuries ago from Mexico and there has been comparatively little change in either method or tools, the art being maintained in pure form by them. The geometric forms that prevail in the designs usually have a significance. 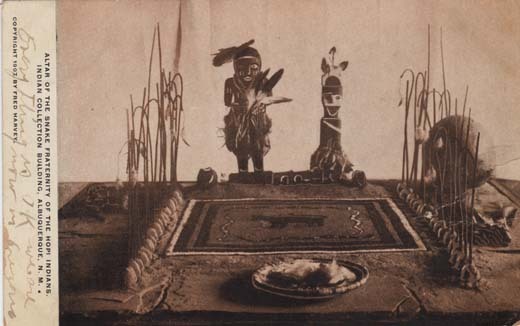 Altar of the Snake Fraternity of the Hopi Indians. 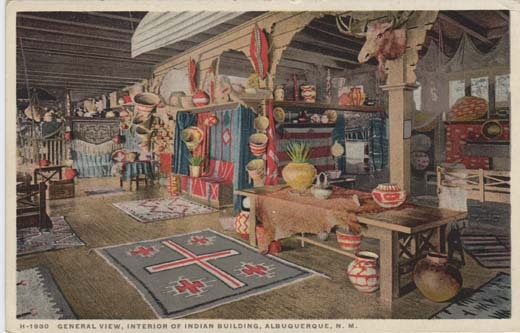 Indian Collection Building, Albuquerque, N.M.